Flattened primers a reliable pressure indicator? Thread: Flattened primers a reliable pressure indicator? I have read more than once that flattened primers are a good indication of high pressure. I was recently shooting a Ruger SBH that I just bought using a 245gr powder coated SWC over 19gr of 2400. Nickel R-P brass and WLR primers. 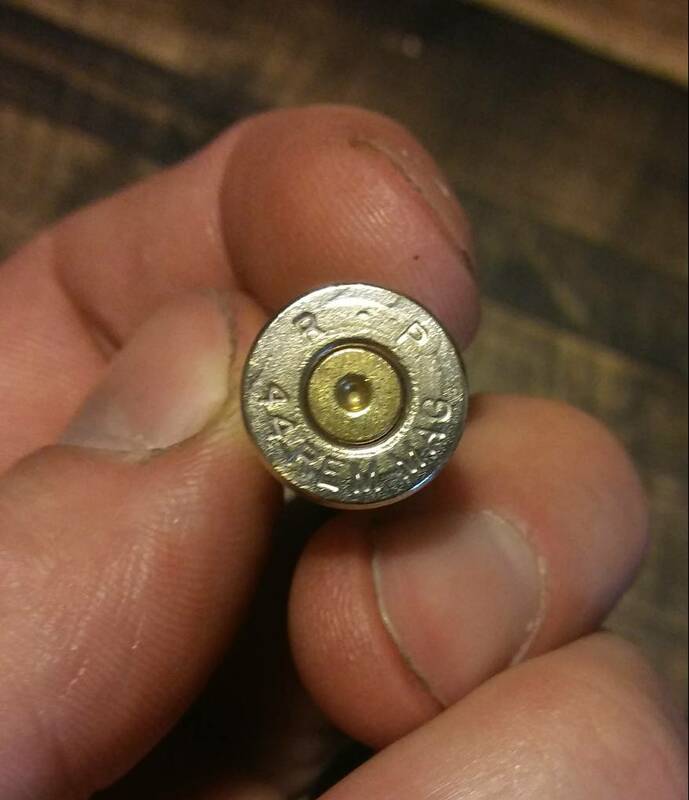 According to the most recent Lyman cast bullet handbook, this is just .5 grain over the starting load. Every primer was completely flattened. Recoil and report was typical of a .44mag revolver, nothing else seemed out of the ordinary. Is this common, or is something amiss? In revolvers primers flatten for reasons other than high chamber pressure. If the cylinder fits in the frame window with more than about 0.002" end shake, the primer will momentarily back out upon firing and then cylinder will recoil back against the frame and flatten the protruding primer cup. The same thing happens in blow-back operated auto-pistols. In magnum-caliber revolvers and high intensity auto-pistols, comparing primer flattening may give a subjective comparison as to when a load is too much, but I would never rely on it to determine whether a load is "safe". Your Ruger is a strong gun and the load you cite is not maximum. Your primer flattening is being caused by LOW pressure because the case is not adhering to the chamber walls and gas pressure is causing the brass to "piston" back against the frame. Like brass cases the primers brass cup and the platings hardness can vary. seating tension vary. Also how the cases grip the chamber walls can have an effect. Most visual sighns of over/high pressure are very subjective as to variables and whats seen or thought to be seen. It does give a very rough idea and can be used on the range when tools arnt available. Better is to fire some factory loads in the fire arm and measure the case heads expansion just above the web. then keep your handloads with in a few ten thousandth of this (.0005). This gives a little better estimation of pressures in a comparison type measurement. On some cases a blade michrometer is needed to make this measurement. Good data is a starting place and gives a decent approximation of pressure performance, The primers will give an idea, as will the case head expansion. As an interesting point. Have you fired and factory ammo thru the revolver yet and How do those primers look compared to your hand load. If you had sticky case extraction AND flattened primers, it would be cause for concern. Exceptionally flattened primers are a pretty good indication of excessive pressure. But normally flattened ones aren't something to rely on as proof of normal pressures. Expansion of the case forward of the web is fairly good, but depends to some extent on the size of the chamber. No measureable expansion of the solid head is perhaps better, but is very difficult to measure with the required precision. I don't trust calipers on fractions of a thousandth, and ordinary micrometer anvils are too large. The tool for the job is a blade or point micrometer, and you need to felt-tip on the individual case what the measurement was before use. Last edited by Ballistics in Scotland; 04-04-2018 at 05:52 AM. WLR in .44 Mag? That's not normal. Would nickel plated cases have more back thrust from not gripping the chambers as tightly? Thanks for all the information and insight everyone. There sure is a lot of knowledge on this forum! Light loads can cause flattened primers . A flattened primer is one thing, if it seriously extrudes into the primer pocket around the firing pin that's another... In 44 Rem Mag, max chamber pressure is 36k psi, all it tells you is chamber pressure is more than 20k psi, really, with that primer. Magnum primers are harder to flatten. If the primers' edges are still a bit rounded everything should be fine, if they're squared that takes more pressure; If extraction is easy that's an OK pressure sign usually, if it takes a 20 pound sledge to remove the cases "Houston, we have a problem!" Here's a fired one, I shot up all of this batch with that combination of brass and primer. The manual says a starting load of 18.5gr is 30,300 CUP. So I'm guessing this load was somewhere in the 31-32k range. Yup, Not bad for a 44. I tried a Keith load of 2400 in my SBH one time with a 245gr 432244 CGLFP. It was too spooky for me. I felt 20 grains was too much in mine so I load 18.6 gr. Yes that one looks fine to me as well. Good macro photo, too They're definitely flatter than they were, but that's normal. Now, if the case head just in front of the web was expanded, I'd worry. In theory they might, a little. But I am sure the effect is far less than a rough or smooth chamber, rough or smooth cases, wet or oily chamber, etc. I believe there have been cases when shooters, unwise in other ways, came unstuck by polishing cases with grease-based jeweller's rouge and not removing all of it. The British system for measuring pressures used to be a test gun which measured thrust on the bolt, with the cartridge case oiled. I don't know if it even lasted until piezo-electric strain gauges came in. But it does come closest to the way pressure actually does harm to most firearms. Here is a case-head in which everything that can be wrong is badly wrong - pimer almost blown at the firing-pin impression, so flattened it is slightly flared where the edge of the pocket is bevelled, and an impression taken from the ejector slot. It was done, I believe and hope, in a remotely fired test gun, during the development of an Improve version of the already monstrous .244 H&H Magnum. Not by me, honest! Thirteen minutes after my post, I am sure he meant the other one. A case being nowhere near as bad as the one I showed you (I started to type "as mine", but thought better of it) is no sign of safety.